173 Beacon is located on the south side of Beacon, between Berkeley and Clarendon, with 171 Beacon to the east and 175 Beacon to the west. 173 Beacon was built ca. 1866 by builder and real estate dealer Paul D. Wallis, one of three contiguous houses (169-171-173 Beacon) he built for speculative sale. He and his wife, Mary Caroline (Pierce) Wallis, lived in West Roxbury. 169 and 171 Beacon form a symmetrical pair, with the entrances centered between two bays extending through the mansard roof. 173 Beacon is of the same design with the entrance on the west side. 173 Beacon appears to have been built in anticipation of there being a companion building at 175 Beacon, forming another symmetrical pair. However, although subsequent remodeling of 175 Beacon has obscured its original design, it does not appear that it was originally a “sister” house to 173 Beacon. 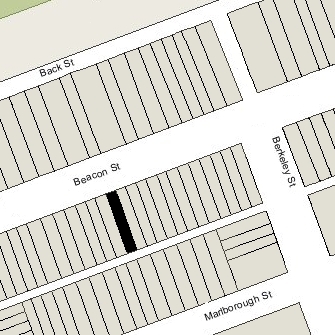 Paul Wallis assembled several parcels of land to create the three 19 foot wide lots for 167-171-173 Beacon. He bought the bulk of the land – a lot with a 50 foot frontage — on May 23, 1866, from Robert Scott. He combined it with two smaller lots he had already acquired on November 17, 1865, a 5 foot 6 inch lot on the west of Robert Scott’s lot which he purchased from real estate dealer Henry Whitwell, and a 1 foot 6 inch strip on the east of Robert Scott’s lot which he purchased from Arthur Lithgow Devens (who had acquired it from Henry Whitwell on the same day). The 1 foot 6 inch strip to the east was part of a parcel originally purchased from the Commonwealth of Massachusetts on September 10, 1859, by George Goss and Norman Carmine Munson, the contractors responsible for filling the Commonwealth’s Back Bay lands. The rest of the land was part of a parcel purchased from the Commonwealth on February 4, 1860, by Norman Munson. Click here for an index to the deeds for 173 Beacon. On April 8, 1868, 173 Beacon was purchased from Paul Wallis by retired shipping merchant Jonathan Willard Peele. He and his wife, Sarah Ann (Silsbee) Peele, made it their home. They previously had lived in Beverly, where they continued to maintain a residence. J. Willard Peele died in September of 1871. Sarah Peele continued to live at 173 Beacon. Their son, Willard S. Peele, lived with her and, by the late 1870s, they were joined by her son-in-law and daughter, Daniel Appleton Dwight and Mary Silsbee (Peele) Dwight. Daniel Dwight was a cotton broker and in the early 1870s had served as president of the White Water Valley Railroad in Ohio. Sarah Peele died in December of 1887. The Dwights and Willard Silsbee Peele continued to live at 173 Beacon until 1894. By 1895, Willard Peele was living in Beverly, and by the 1895-1896 winter season, the Dwights were living at 312 Marlborough. On October 11, 1894, 173 Beacon was purchased from the Peele family by Mary King (Squibb) Munro, the wife of Dr. John Cummings Munro. He also maintained his medical offices there. They previously had lived (and he had maintained his office) at 367 Boylston. John Munro was a physician and surgeon, and was the first surgeon-in-chief of Carney Hospital. John Munro died in December of 1910. Mary Munro continued to live at 173 Beacon during the 1913-1914 winter season, but moved thereafter and by 1920 was living in Milton. She continued to own 173 Beacon and lease it to others. The house was not listed in the 1915 Blue Book. By the 1915-1916 winter season, 173 Beacon was the home of investment banker Walter Hunnewell, Jr., and his wife, Minna Cornelia (Lyman) Hunnewell. Walter Hunnewell was the grandson of J. Willard and Sarah Ann Peele, who had owned and lived at 173 Beacon in the 1870s and 1880s (Walter Hunnewell’s mother was Jane Appleton Peele). The Hunnewells continued to live there during the 1919-1920 season but moved thereafter to 36 Commonwealth. On September 3, 1920, 173 Beacon was purchased from Mary Munro by paper manufacturer Valentine Hollingsworth. He and his wife, Ruby Julia (McCormick) Hollingsworth, had married in June of 1920 and 173 Beacon probably was their first home together. By 1923, they had moved to 191 Marlborough. On August 24, 1922, 173 Beacon was acquired by Channing Harris Cox. He and his wife, Mary (Young) Cox, made it their home. They previously had lived at 90 Fenway. They also maintained a home in North Scituate. Channing Cox served as Governor of Massachusetts from 1921 through 1924. After leaving office, he retired from politics and became a banker, serving as vice president of the First National Bank and then as president of the Old Colony Trust Company. 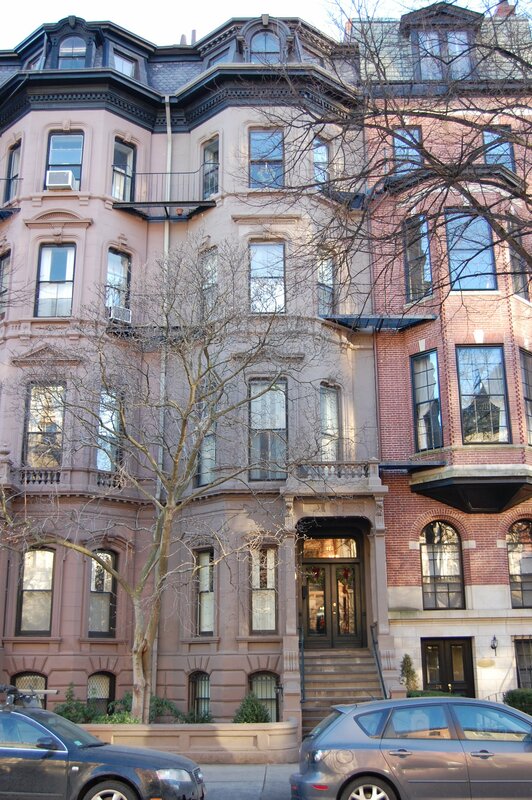 The Coxes continued to live at 173 Beacon until about 1949, when they moved to an apartment at 172 Beacon. On September 15, 1949, 173 Beacon was acquired from Channing Cox by real estate dealer Thomas J. Diab. On November 14, 1949, 173 Beacon was purchased from Thomas Diab by Paul Revere Barros Lundgren and his wife, Mary Gloria (Cordeira) Lundgren. They previously had lived at 30 Gloucester. He was a salesman with a furrier and later would operate a construction company. He was born Paul Revere Barros, but took the surname of his step-father, Frans Anders Johan Lundgren. In February of 1951, he applied to change the occupancy from a single-family dwelling into a three-family dwelling and lodging house. He abandoned the permit and in February of 1954, he applied again, seeking to legalize the occupancy as a single-family dwelling and lodging house. The change in occupancy was subsequently approved. Paul and Gloria Lundgren lived at 173 Beacon and operated it as a lodging house. On January 7, 1954, they transferred the property into Gloria Lundgren’s name, and she transferred it to herself as trustee for the benefit of their two daughters, Joan Glora (Lundgren) Ikasalo, the wife of Stanley E. Ikasalo, and Pauline Barbara Lundgren. The Lundgrens divorced in the late 1950s; he remarried to Lucy Emma Kressling and they moved to Reno, Nevada, in 1958. Gloria Lundgren continued to live at 173 Beacon until about 1980. On January 5, 1981, 173 Beacon was purchased from Gloria Lundgren and her daughters by the 173 Beacon Development Corporation (Arthur E. Simons, president and treasurer). On August 6, 1981, it sold the property to the 173 Beacon Development Corporation (Young K. Park, president and treasurer). In October of 1981, the 173 Beacon Development Corporation applied for (and subsequently received) permission to remodel the property into six apartments. On April 9, 1982, it converted the property into six condominium units , the La Residence Condominium.